McKesson Medi-Pak Performance Blue Isolation Gowns are disposable one-size-fits-most medical gowns. The gowns have a full back and tie at the neck and waist. They feature long sleeves with elastic cuffs that fit snugly under gloves. They are fluid resistant and made of polypropylene. The universal one-size-fits-most make them convenient for use in many medical environments including hospitals, doctor offices, hospice, and many others. The ties at the neck and waist offer individual size adjustment. 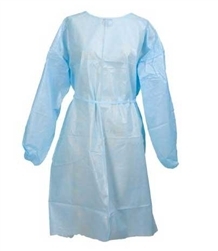 McKesson Medi-Pak Gowns are non-sterile and not made with rubber latex.